As I mentioned in my rant review of Roger’s Diner, I’ll begin to rant on some of the eateries and hot spots here in Qatar. 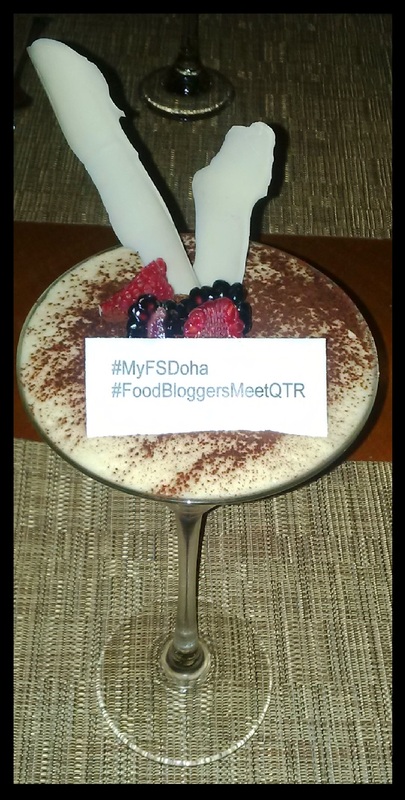 Sharing this idea with some of my favorite bloggers here in Qatar, I was honored to be invited to the Food Bloggers Qatar‘s first meetup on February 21st, organized by Food Bloggers Qatar & Hungry Birds Doha‘s very own Doaa Jabir. The event took place at the Four Season’s Il Teatro, currently run by Chef Marco Arlotti. Since this was my first experience at Four Seasons all together, I was extremely excited! For only 150QR, we indulged in a 5 course meal, a chance to interact with amazing food bloggers and left with a goodie bag worth over 200QR! Kudos Doaa for a fabulous and well organized event. With her blessings, here is my take on the evening. 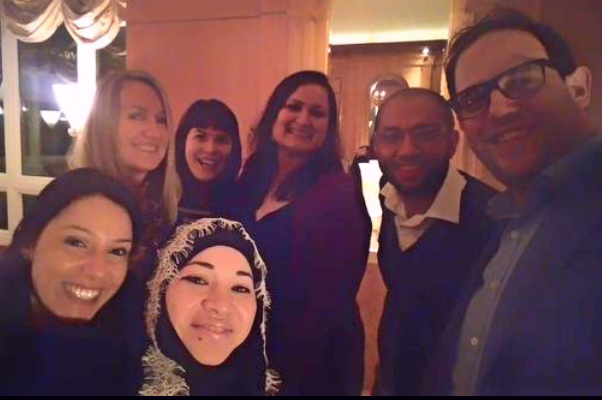 But first, let’s take a #FoodBloggersQatar selfie! c/o of Doaa Jabir’s phone via Haytham Bennani. The idea to hold the first Food Bloggers Meetup at a location as grand as the Four Seasons, right off of Diplomatic Road in Doha, was very smart. Free valet parking, helpful, smiling staff and a calm atmosphere on a Saturday evening was a great way to get you in the mood to mingle and eat! We had a lovely indoor, quite intimate, set up arranged just for our large group. Our hostess encouraged us to change seats and interact with one another. Throughout the evening, individuals introduced themselves, their work and why they do what they do. Amongst us were chefs, bakers and simple food lovers like myself. Despite the love of food that brought us together that evening, everyone was unique and different in their approach and expression of this love. And if you were a fan of one’s work, it was wonderful to put a face to the name. The highlight of my evening was not only meeting those I was already a fan of, but discovering those I should be a fan of! For example, I meet for the first time Zomato‘s Country Manager, Haytham Bennani whom encouraged our work in support of bringing forth the best eateries to the spot light. We had a very interesting conversation about the our individual work and he gave me a few tips to continue ranting away on my love for food. I am now a fan! Of course, when food is good, it’s always a delight to meet the chef! 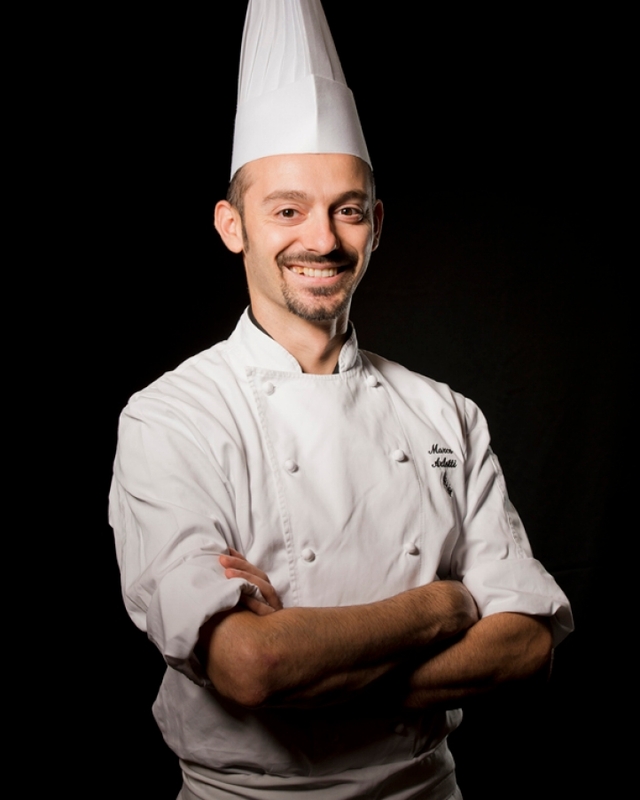 Chef Arlotti spoke to us about his work in Italy before moving to Doha just a few months prior. Despite his young age, the man has year, I mean years of experience and ideas galore to present to the table. I look forward to tasting more of what he has to offer. Overall, the event was a huge success! We were a full house of happily stuffed people already discussing when the next meetup would take place. Doaa has her plates set! Additionally, I’d like to thank Four Seasons for adding to our goodie bag the beautiful journal. I’ve decided to use it to outline my “I’m Always Hungry” rants! “How have I not come here before?” was the question that swam through my head from the moment I walked in to the moment I walked out of Il Teatro. The décor was elegant yet simple, the staff were welcoming, the lighting was deem, creating a calm atmosphere. Even though the lighting may not necessarily have been great for photography (which should explain the photo quality of some images here), maybe that was the catch. More focus on the experience rather than the need to Instagram your meal? The set menu provided to us made it seem that we’d be treated to a 4 course meal and because the words “lasagna” and “spring chicken” made my eyes sparkle, I assumed, small portions to taste everything. I was wrong, oh so wrong! My messy but yummy seared scallops with caviar. 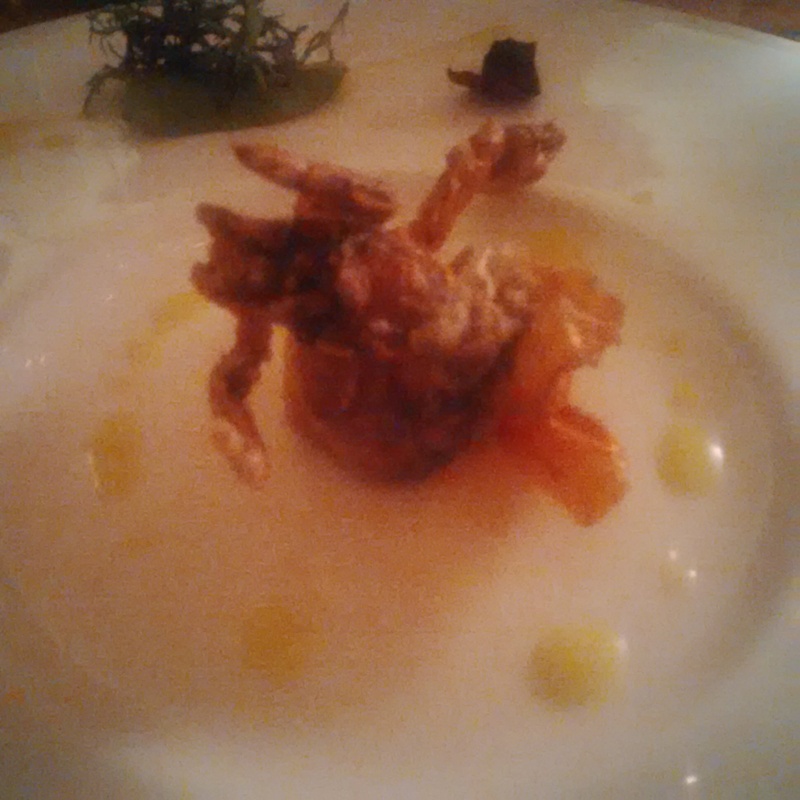 We were surprised by a soft crab amuse bouche of sorts as a treat. If you know me, you know I don’t do crab, I just don’t. When it comes to shell fish, I prefer lobster and shrimp. However, since it was a first time for everything, I thought to myself, “after oh so many years of not touching crab, tonight was the night.” This crab was not only indeed softer than I’d expect but very flavorful, cooked to perfection, decadent to be exact. I couldn’t believe I finished that plate. 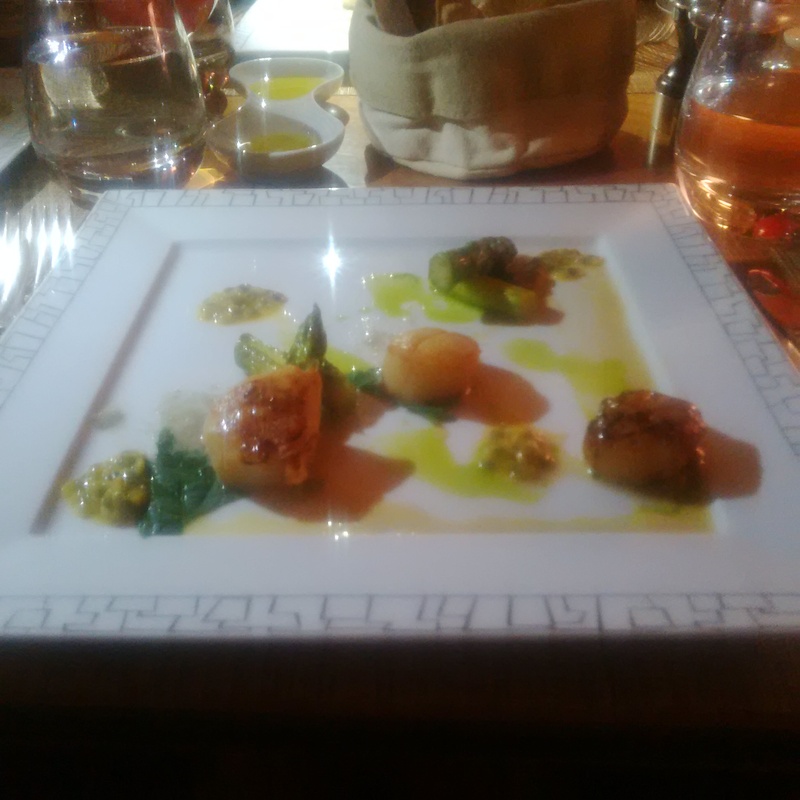 Then the originally set menu began with seared scallops garnished with caviar. The presentation was mixed. My plate came as if it had almost fallen from the poor waiter’s hands while others plates looked exceptionally beautiful. Of course the photo on my Instagram was not of my plate but it was too pretty to not steal a snapshot of. The caviar complementing the scallops made my messy plate worth while. I highly recommend this appetizer. Yes, entrees with an “s”, plural because we were given two dishes not two options as I had originally thought. Can you imagine my excitement? 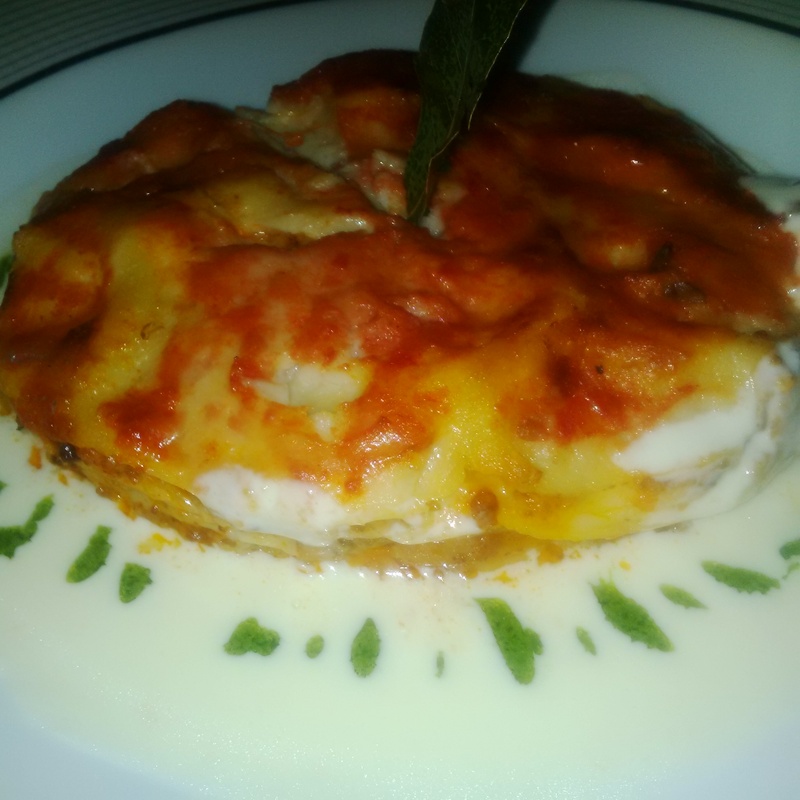 We were served lasagna with parmesan sauce and spring chicken breast, roasted with light gravy and asparagus. The lasagna was an average sized circular cut portion that needed a bit of salt and pepper. However, it was absolutely delicious. So delicious, for a moment all you heard across the room were the forks against the plates as it picked up pieces of this deliciousness into the silent salivating mouths. It’s that type of silence that let’s you know something is oh so good! So good, when the chicken arrived, everyone looked around wondering, “is it wrong to be full already?” Of course, my hungry self had to go for it and it was simply divine. The chicken was tender, the gravy was just right for the portion that was just as large as the lasagna. 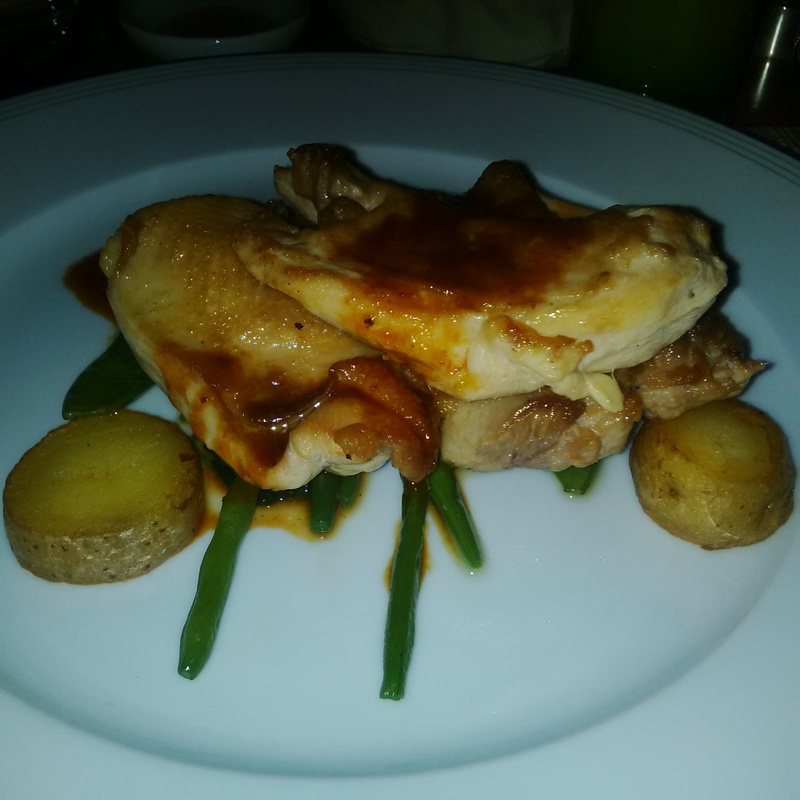 I tried my best, trust me, to finish the tender chicken. I took a bite, had a sip of my specially made pineapple free mocktail, waited, talked, waited, laughed then repeated the steps. I’ve never been so upset for food being taken away from in front of me like I was with this chicken. How something as simple as lasagna and chicken can take over one’s senses is simply beyond me. Hat’s off to Chef Marco! Tiramisu. I’ve had such bad experiences with this complex dessert. Some are too bitter. Some are too sweet for my sweet tooth. Some simply don’t deserve the name all together! 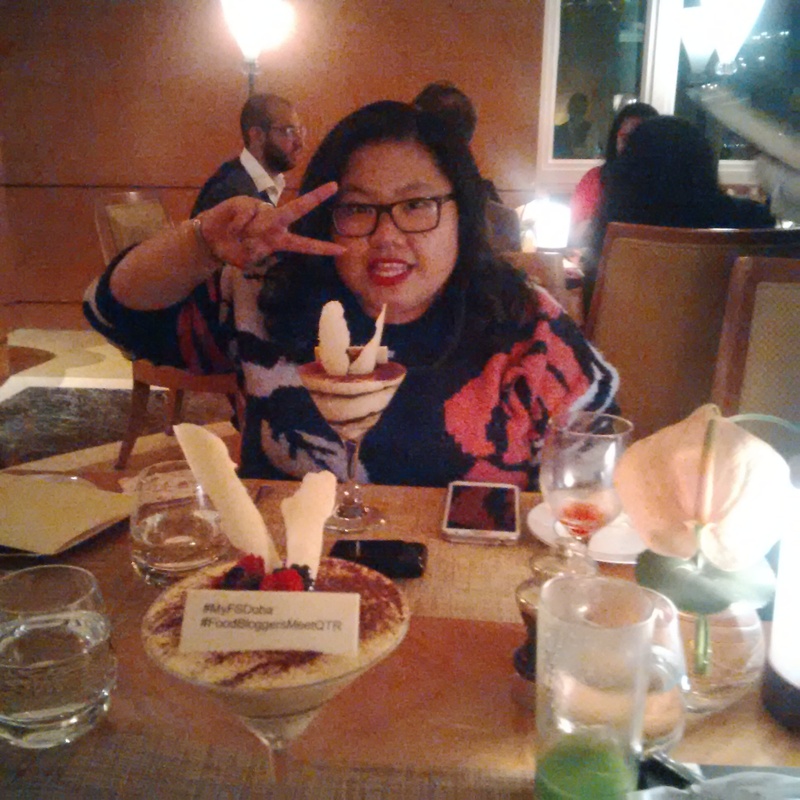 Il Teatro, by far, served the best tiramisu I’ve ever had in Doha… in Qatar… in this part of the world! It seriously tops my list of the best tiramisus I’ve ever had! I couldn’t stop ranting all night at how great this tiramisu is. If we made comments here and there about anything that was served to us that night, we all unanimously agreed the tiramisu was a hit! Plated in a large martini glass, topped with an eatable salute to Food Bloggers Qatar & the Four Seasons, this tiramisu was extremely light, fluffy and I’m assuming had a lovely hint of nutmeg. If you have anything at Il Teatro, anything at all, have the tiramisu! This glass of goodness can seriously turn any long day into the best day ever. 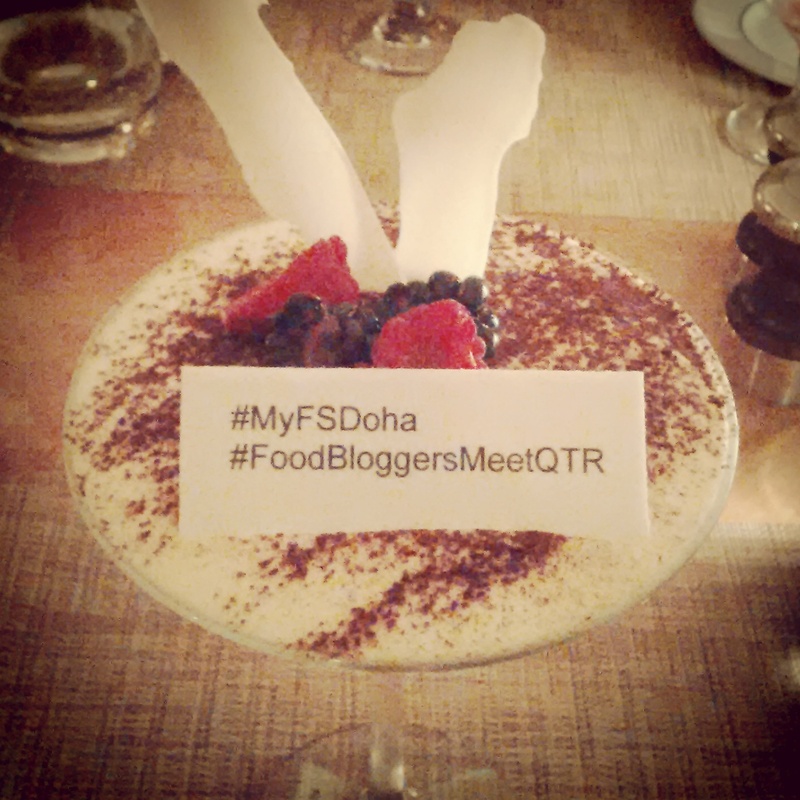 Food Bloggers Qatar Meetup = Fantastic, well organized and just plain fun! Four Seasons Hotel = Wonderful, just wonderful!